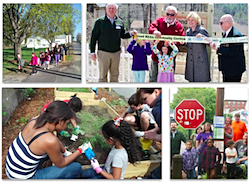 The HEAL team is excited about the prospects 2015 holds for HEAL NH and its partners to build on the six-year foundation of collaborative efforts that began with the launch of the 2008 Healthy Eating Active Living Action Plan for New Hampshire. We now have a new roadmap - the five-year Healthy People Healthy Places Plan - and we are already off and running. The monthly HEAL e-newsletter is usually a forum to highlight the successes of HEAL community coalitions across the state, and provide tools and resources to HEAL network partners. With the goal to inspire the HEAL network to accelerate its collaborative efforts, this month's newsletter is dedicated to providing an overview of HEAL's direction moving forward. HEAL team members, Beth Gustafson-Wheeler, Nik Coates and Michelle Morel will preview the HEAL network's future efforts to build a bigger and stronger community coalition collaborative, and advance active recreation and active transportation strategies, work that is well underway. Where does your work align with HEAL's? As you read through our website, consider where your work aligns with HEAL's, and as a network of dedicated partners, we can collectively work to create healthier people and places in New Hampshire. During 2014, the HEAL network stepped up its efforts to implement policy, systems and environmental strategies to increase equitable access to healthy foods and opportunities for physical activity. Greater connectivity and alignment between state and community partners was a critical lever to strengthen collaborative efforts. The 2014 statewide HEAL Conference showcased the work of HEAL partners at state and community levels. The conference made national news, touting HEAL's collective impact approach to implementing innovative population-based policy, systems, and environmental strategies to address New Hampshire's obesity and chronic disease burden. The conference, framed by the theme, "Accelerating Progress Towards Healthy People and Healthy Places", highlighted the successes, challenges and lessons learned of HEAL Community Coalitions blanketing the state. The 2014-2019 Healthy People Healthy Places Plan was unveiled, and table discussions brought people together to identify actions to advance HEAL in their own regions and localities. Click here to read a comprehensive summary of the outcomes of the regional dialogues. HEAL network partner's seasoned experience informs the next phase of work. The vision is Healthy People and Healthy Places. The mission is to provide equitable opportunities for all New Hampshire residents to make healthy choices. Organizations and individuals throughout the state are rallying around this vision and mission. Success over the next five years will be ensured by your continuing dedication to the network. This is a renewed call to action to re-ignite the HEAL Leadership Council, community coalitions, committees, and working groups to accelerate their collective efforts. Thanks to engaged partners like you, and foundations like the HNH Foundation,Endowment for Health, New Hampshire Charitable Foundation, Anthem Blue Cross & Blue Shield Foundation, NH Department of Health and Human Services, and Harvard Pilgrim Health Care Foundation, the future looks bright for HEAL.